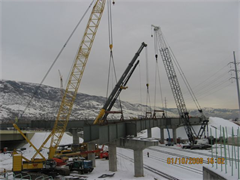 OlsenBeal Associates was founded in 1986 to fill the need for high quality industrial construction work and industrial maintenance here in Utah. 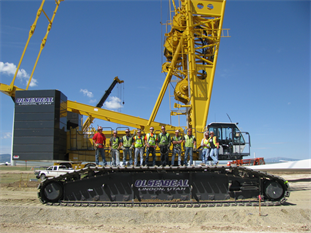 Since that time, OlsenBeal has evolved to serve the needs of heavy lift projects across the Western United States. For many years our main business has been bridge erection, but in 1999, seeing a niche and need in the young and upcoming wind energy business, we expanded our services to include wind turbine erection. As we specialize in projects that require precision, performance, and have high levels of risk, it was a natural and smooth transition for us. Since that time, OlsenBeal has become a well-known and well-respected company in the windmill erection industry. 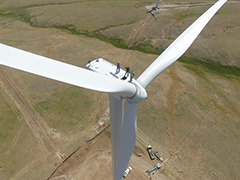 We have erected over a thousand wind turbine generators manufactured by several different turbine suppliers including Clipper, Gamesa, GE, Mitsubishi Heavy Industries (MHI), NEG Micon, Nordex, and Vestas. Some of our clients include NextEra (formerly FLPE), Blattner Energy, AES (formerly SeaWest), TVIG, Signal Energy, Thorstad Companies, Vestas-AWT and Renewable Energy Systems (RES). Our logistics specialists can assist with any project transportation needs. We will work with your company to find, setup, and permit rail siding locations, and perform all loading, hauling, and on site “double handling”. We have the capability to load and haul all turbine and tower components on site, as well as perform the loading and hauling from railhead / manufacturers locations to project sites. Because we own our cranes and hauling equipment, we have more control over cost, labor, and other issues that may inhibit other companies in their pricing and performance. We love what we do and we look forward to working with you. From Heavy Highway and Heavy Industrial to Wind Power and Heavy Rigging projects, we have the experience, tools, and knowledge to make your project a sucess. OlsenBeal holds the Advanced Certified Steel Erector Certifcation from the American Instititute of Steel Construction (AISC). This status ensures that you can move forward with confidence in getting a quality service. Check your worries off the list when it comes to erecting. © 2010 OlsenBeal. All rights reserved.